SpaceX reached a somewhat nonsensical milestone on Tuesday by launching the first car into space. 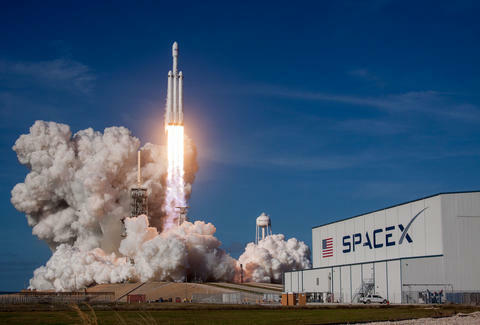 The successful test launch of the Falcon Heavy rocket, which included Elon Musk's personal Tesla Roadster in its payload, demonstrates an option for cheaper satellite delivery, and a way to bring rockets back to Earth after they streak through the cosmos. The note "made on Earth by humans" is written on the car's circuit board, so it isn't prominently displayed, but it might suffice as a friendly greeting to an extraterrestial. In addition to the Roadster, the Falcon Heavy's upper stage is ferrying the car's dummy operator, appropriately named "Starman" by SpaceX. The company streamed the first four hours of the rocket's journey, with Starman behind the wheel as the Roadster drifts away from terra firma. Words of encouragement are there for the space-journeyman, as the message "DON'T PANIC!" is scrawled on the car's dashboard. Starman appears to have nerves of steel, though, so the message might fail to resonate. SpaceX's video is admittedly very long, but the footage is breathtaking at times. Simultaneously a marketing spectacle and feat of modern science, the first Tesla in space largely went off without major hiccups. Two of the Falcon Heavy's boosters successfully landed back at Kennedy, while the third, middle booster failed to land on a drone ship and crashed into the ocean, the company confirmed.